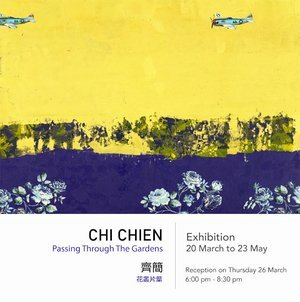 One central theme runs through Chi Chien’s work as he seeks to find the “Truth of Painting”. In “Passing Through the Gardens”, he explores the spatial relationship of the subjects through the separations of different dimensional planes on the same surface using visual artifice. In this series, Chi replaces the traditional canvas with readymade printed fabrics of repeat floral patterns that extend throughout the whole piece of cloth. To illustrate this concept, Chi paints over large stretches of the cloth, meticulously leaving selected parts unpainted allowing the remaining flowers or motifs to assume a tangible, spatial dimension on the fabric. As a result, this transforms the visual appearance of the flower pattern from being flat to spatial and for the overall work to resemble a landscape. Purposely disrupting the consistent flatness and accentuating certain elements has the interesting effect of interchanging the roles of the supporting canvas and the painted parts. The painted parts become the background while the unpainted parts, paradoxically, become the subject of the painting. “Facing flowers, I paint a picture. So I said: "I painted a painting." I then take this ‘painting’ and paint it on a canvas. And I said: "I painted a painting." Finally, I paint again on this painting and hang it on a wall. I said again: "I painted a painting."